2) Older students can practice ironing, with adult supervision. 3) Show older children how to starch clothes. CAN help with a glycerin-soap (melt in the microwave) soap craft. of water you used, how would it change the way you cleaned and bathed? expensive in the past and many people had at least silver-plate if not sterling silver. 19th century bed was a little more difficult at times, especially with a feather-bed, which had to be smoothed. What kinds of work does your mother do around your house? Do you help clean? Do you help wash clothes? Can you wash dishes and sweep the floor? most people did not have running water, electric lights, or vacuum cleaners. In the 19th century, women, children and servants did most of the housework. Many women had to work very hard. One important thing that most mothers do today is take care of their children. How does your mother care for you? Most mothers in the past took care of their children, too. Sometimes they had another woman to help them. Sometimes older sisters or brothers took care of little sisters or brothers. a woman was expected to live a life of leisure. All heavy and menial work was supposed to be done by servants. parlors, or sitting in gardens. They rarely showed women working. The reality, however, was often much different. Most American women had to do at least some work. clothing or hats that were better suited to an upper-class lady. production and sewing. Now we will look at other "women's work." required to put sheets over expensive furniture before cleaning out the fireplace. family did this job. After the dishes were washed, dried and put away, the woman might go to clean the bedrooms. pot. Every morning these had to be emptied in the privy then washed with hot water and returned to the room. Some people dusted every day. Wood and coal-burning fires were very dusty and left soot on the furniture. outside and beaten to get the dust out. Carpets were taken outside once or twice a year and beaten. chimneys washed. If candles were used, the wicks might have to be trimmed. to milk-processing were usually scrubbed and scalded. for the younger children and a governess or tutor to teach the older ones. see in the next chapter, mothers were also responsible for tending sick and injured children. hard and tiring job, or from the bags of bluing they used in the water. might have to be hauled from a spring or well.....and washing required about 40 gallons of water. 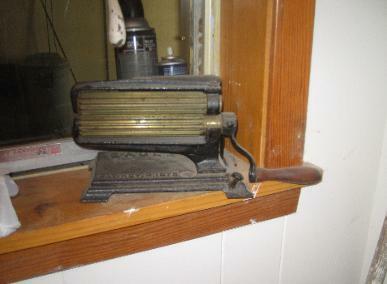 wringer was such a major innovation. It pressed the water from the clothes, making them lighter to handle. A fluting iron for ironing pleats into ruffles on clothes. starched, while other items were cold starched. After drying, the clothes were sprinkled with water and then ironed. were mended with the use of a darning egg. beer, wine from local fruit and berries, and cordials for illness. Beer was a favorite drink early on. “Small Beer” was a low-alcohol beer that was even drunk by children. social problems on alcoholism and encouraged people to pledge to teetotalism. made it unnecessary for women to make alcohol. Any extra cleaning was done on Fridays. In addition to these jobs, most women juggled special cleaning and tasks. might have a strong "bite" that would sting. soap. Some women apparently made soft-soap on purpose rather than taking the time to let it harden. the exact strength of the chemical. This made soap-making a more exact science. Candles could also be purchased, although thrifty housewives continued to make their own. burning at the same time. straw or hay was brought, and the fabric mattress-cover washed, dried, and refilled.